For everything that is there now, there is a reference in some ancient Indian book! Yeah, you can check. Even if there isn't, someone will say there was! We take credit for everything! Not a bad thing, though. Biriyani is no exception. The awesome awesome biriyani with all its variety in flavour and spice and all things food, has an ancient Indian mention in the 2 century. Called, 'Oon Soru,' the reference talks about a one pot dish, with a variety of flavours, meat and veggies. Isn't biriyani the same? But references to the oon soru talks about more than just meat, but different consistencies of meat. The reference talks about the dish being made for soldiers for whom all kinds of flavours and meat were essential not just to keep their spirits and energies high, but also to ensure that it could be packed easily and can be taken and eaten easily. I'm sure they knew that eating chapati, dipping in gravy and having a side dish wasn't exactly a good dining strategy during war. So, why am I going on and on about this oon soru? While I love biriyani and am a self appointed biriyani connoisseur, I never, I repeat, NEVER expected to ever come across this dish, EVER. Yesterday at Dakshin, while we were there for a quiet dinner, I might have just been to the 2nd century. I will write about the experience at Dakshin in a different post, but I really needed to get my backside to my mac and really put this one up. The chef here might have just recreated the 2nd century oon soru. When I saw the dish, I thought it was something like a polichadu. 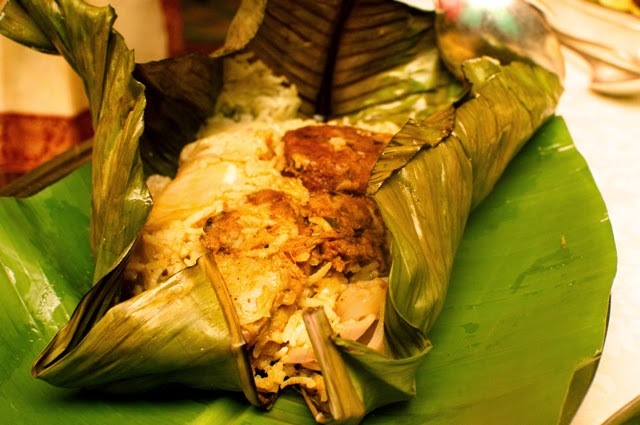 It was wrapped in a banana leaf. When I opened it, I saw white rice. WHITE RICE. And bunches of something. There was a chicken cutlet, a fried egg, mutton chukka type something, a chunk of chicken and some spices. The flavour was quite strong initially, but after the first two spoonfuls, it somehow toned down. Flavour was fabulous. Having mutton, chicken and egg in a single dish might be an over kill in theory, but it was balanced perfectly. Awesome. Apparently it is aimed at those who are craving for biriyani after having liver enhancing tonics on Saturday nights. Since I don't know what that craving is, I don't know if its right for them, but its right for anybody. Priced at Rs. 750 nett for the non veg and I don't know what the veg version has and its price! Its available in their 24 hour coffee shop all night long, but not sure if it will be on the Dakshin menu.